You must make reservations at least 5 minutes in advance of the time at LV Mar. A public​ parking structure is located right behind us! There's also ample street parking. LV Mar is a neighborhood tapas & cocktail eatery with the belief that the richness of life should be savored at every moment. So our mission is to create a transcendent dining experience characterized by culinary discovery, sociability, and relaxation. 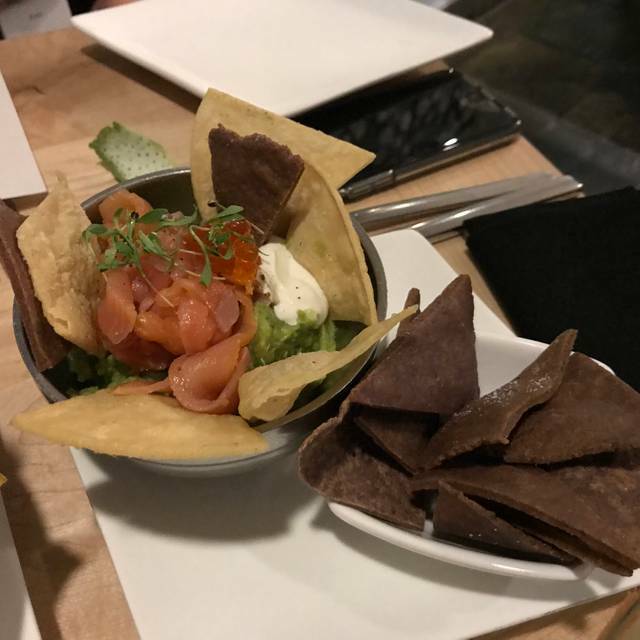 So as our guest, our promise is to continually offer rich tapas and cocktails with innovative flavor profiles, personable service from a knowledgeable & engaging staff, set in an elegant space that engenders comfort and community. Michelin Recommended 2015, 2016, 2017. 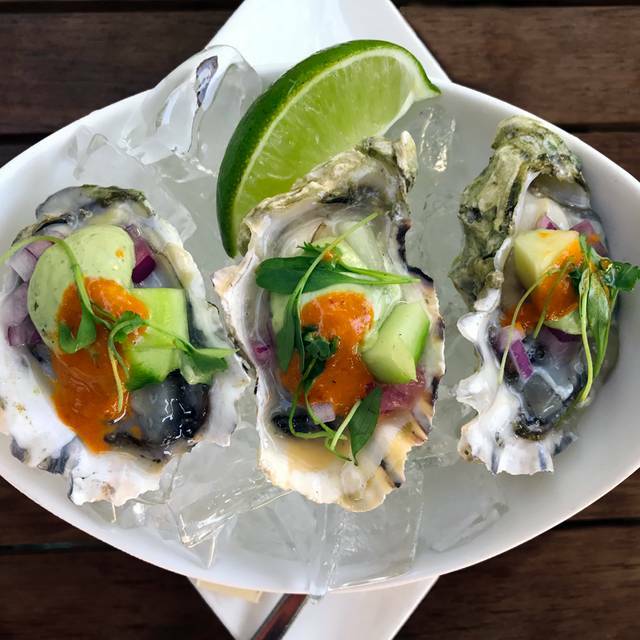 Happy Hour: Sips and Bites to Share! 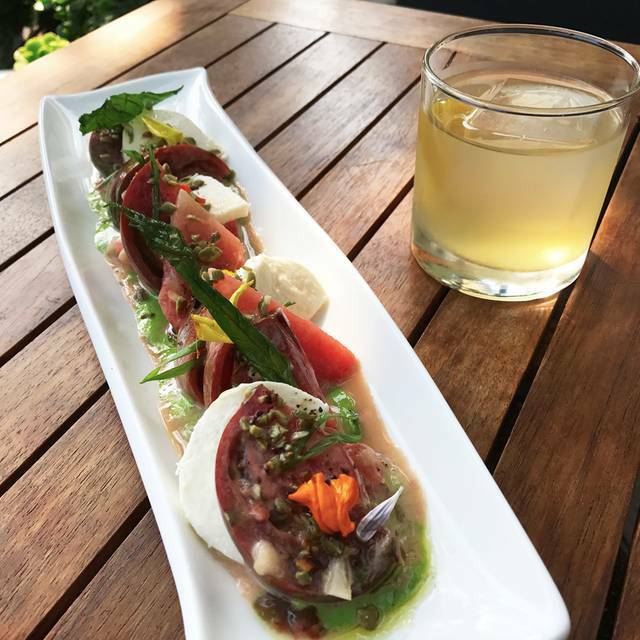 Happy Hour= Tasty Tapas and Refreshing Cocktails in Beautiful Downtown Redwood City! Bottomless Mimosas, Brunch and Chilaquiles! Enjoy Brunch At the Bar, Patio or the Main Dining Room with our flavored Bottomless Mimosas and tasty Egg Plates! Cinco De Mayo- Margaritas, Cervezas & Comida- Join Us! Celebrate with us and enjoy the creative Mexican food and drinks by our a Chef Manuel and Mixologist Eusebio. Cheers! Celebrate Mom at LV Mar- Treat Mom with awesome tapas and cocktails! 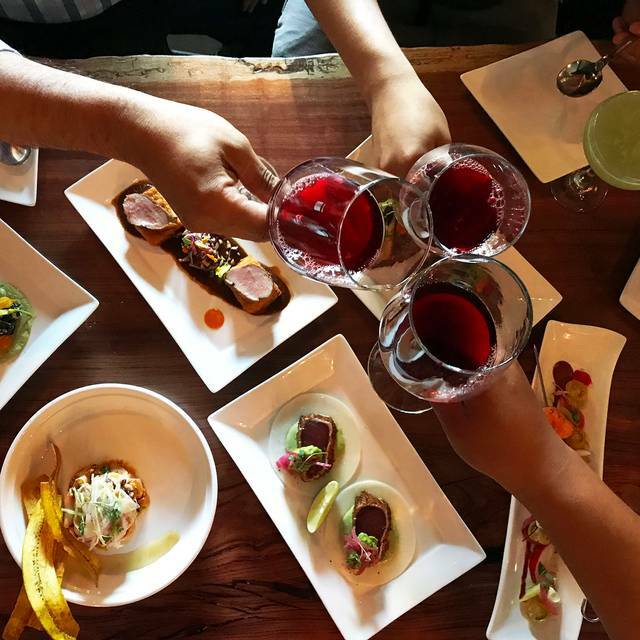 Celebrate Dad with Style- High Caliber Tapas and Cocktails! Food was great, as always. My only criticism is that we asked for extra chips for our guacamole and we were charged $7 for them. The food is delicious! Service was good, but did have to wait some time for water and a menu, as I was the fourth person in our party and showed up a few minutes late. I would efinitely recommend LV Mar. Very fresh food! Food was great, fun ambience. I’ve been to the restaurant several times before. All the staff are very friendly. Our server recommended a lovely cocktail and was smiley the whole time. My only critiques are that she added on an extra taco for each type that we ordered (two come per order, we were a party of 3) without asking us. 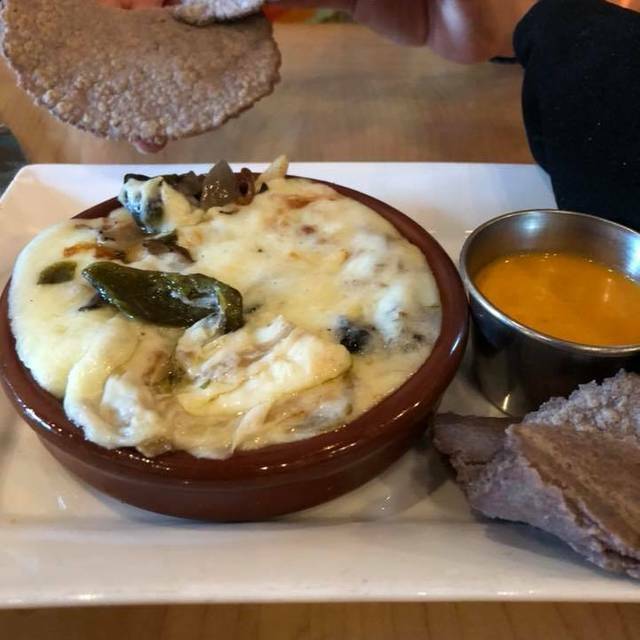 Given that each of us had dietary preferences that were different, we had ordered assuming two tacos per order and had WAY too much food as a result of her modification. She even commented that we had a lot of food coming before it arrived. That led to a lot of food waste (some of it didn’t lend itself to leftovers) and spending more than anticipated. She also made it very clear that she wanted us to close our check out (it was 9.30 at the latest) which made us feel less welcome at the end of the meal. Food quality was not what it has been on previous visits (I hadn’t been in over a year). Sorry to see that as that strip of RWC has some great eateries and bars. Excellent food and service. Restaurant is well decorated but the noise level made it so hard to fir my dinner companion and me to hear each other. If they can do something to improve the acoustical dampening, it would be so much more pleasant. Every single dish was delectable and beautifully presented. Attentive and friendly service. Our group of 7 was treated wonderfully and left very happy. Delicious fresh and imaginative tapas and tacos. Bravo! Amazing tapas and tequila...the head guy knows his stuff on the tequila. First time at LV Mar...celebrating our anniversary. Loved the food, very creative and tasty. They were not busy since it was a Monday evening so we got lots of attention from the staff! The food was very good! Interesting flavors and textures. There was a strange smell, almost like nail polish, at our table near the front window. Service was not good. The restaurant was almost empty but our dishes came out with too long waits in between. People seated after us got served long before we did. One of our diners did not get any of what she ordered until long after the rest of us were served. And one of our orders was incorrect, so we had to wait even more. It was awkward. The restaurant was 80% empty on that Sunday evening, multiple staff congregated at the back, chatting. But, the food was memorable. Had stake and it was delicious. I'm not a seafood eater, so I wished there were more non-seafood options, but Ocean is in the name of the restaurant, so its me who needs to adjust in this instance. Drinks were a bit overpriced. Food was great, especially the salad and the tacos. Our ribeye was good as well. Wine was fantastic. Service was good, even as they got busier. Food was great! Drinks took a bit too long to get to us though. Good cocktails but the food was very so-so. Ceviche not as good as I remembered from last time, and the calamari, very average. 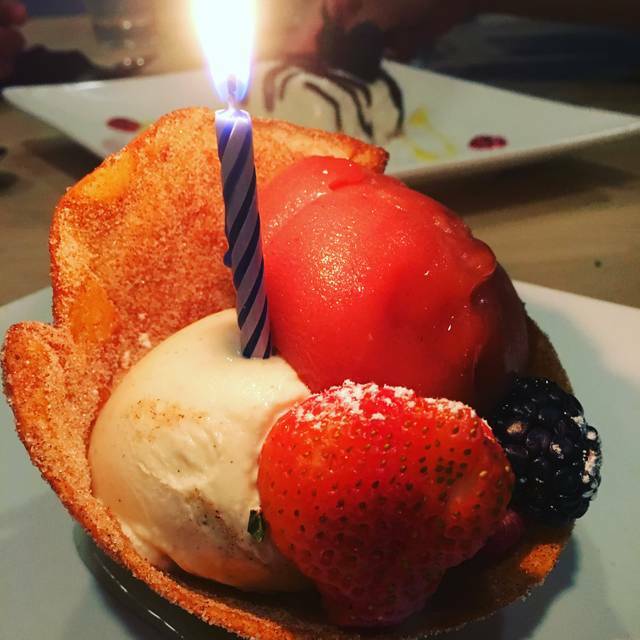 LV Mar is one of our favorite places to dine in the heart of downtown RWC. Easy access - right next to a parking structure, block from movies and Fox theatre. Can get crowded on weekends - so reservations highly recommended. The food is reliably delicious - we had the ceviche mixto (mixed ceviche with octopus, shrimp, seabass and citrus), pato a la diabla (seared duck breast on potato confit), cayo dorado (seared scallop), pancita de puerco (pork belly tacos) -each one cooked to perfection, plated and served beautifully. The Sabanero cocktail had a real kick to it but was awesome. Service can be a little slow on Friday nights - but overall a great dining experience that we would definitely recommend! We had an enjoyable dinner with great food and service. The only issue is that it is rather noisy so conversation is a bit difficult. Our server was very sweet and helped us make our choices. I had the chicken empanadas and they were flaky and light with a robust filling. Great brunch, outside. Good service and food/drink. We went there a couple of time and the food was superb, this time we went between the official lunch time and dinner time and the menu offered was not as good as I used to at lunch and dinner. However the cocktails are fantastic. Excellent customer service! The owner Manuel gives everyone the royal treatment when dining in his restaurants. Manuel and is staff are great with kids as well, our Son loves dining here. 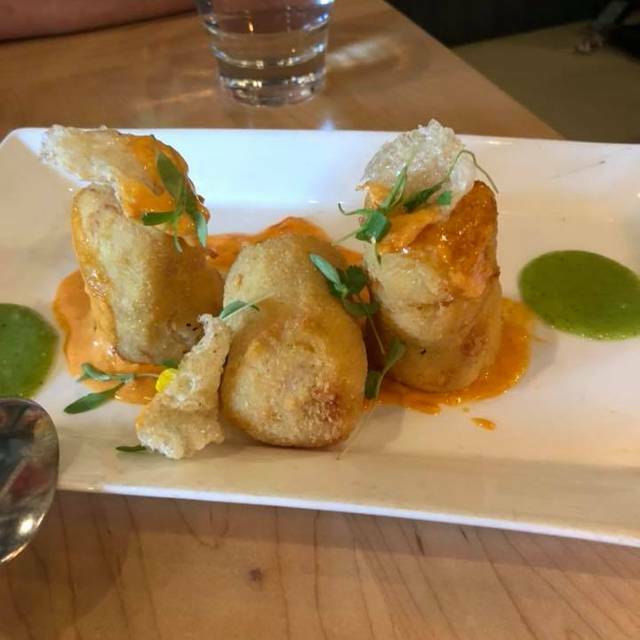 The food is delicious and the menu is creative! All the dishes are so wonderful, that it’s fun to order a number of them and share them with the table. We no longer live in the Bay Area, but when we are in town, we make it a point to eat at LV Mar! A couple of hours before my reservation I got a call from the restaurant "confirming my reservation". When I said yes, I was then informed "We are really busy tonight so if you come at your reservation time your table wont be ready and you'll have to wait". I was flabbergasted since I thought the point of a reservation was to have a table reserved. I was then asked if I wanted to change my reservation. I asked the woman on the phone if she was going to honor my reservation. The response was cryptic and evasive saying that they would honor my reservation but I would have to wait for my table. I was confused and frustrated. When we arrived, the restaurant was half empty but I was told that my table was not ready. We got a drink at the bar while we waited. No staff on the phone or at the restaurant ever apologized for our inconvenience. While the rest of the restaurant was fine, this experience left a bad taste in my mouth and was incredibly unprofessional. Our server Sophia gave us excellent customer service the food was exotic and and extremely tasty we had a fabulous experience five star! Chef Manuel Martinez really has a gem in the middle of Silicon Valley! Food was good as expected. Service was a combination of rushed and haphazard at best. It was clear that the restaurant wanted to turn the table fast, minutes despite our ordering a number of expensive dishes (oysters, etc.) and beverages. This is how good restaurants can quickly fail. Lovely flavours and combinations in the food. Glad we had an outside table as inside looked crowded. Service very good. Lively and vibrant joint with friendly staff but the food lacked any real punch and was desperately over priced and under seasoned. The staff struggled to cope forgetting what they had and hadn’t bought out and the bar was a little slow. The cocktails were great and the wine we chose (half the price of the ‘recommended wine’) was perfectly fine. I would say great for pre dinner cocktails and a couple of nibbles but not worth staying the entire night. Great food, service, but the noise level takes away from the experience! Came here for lunch to try some tapas. Food was good and service was prompt. It is a 3.5 star kind of spot. 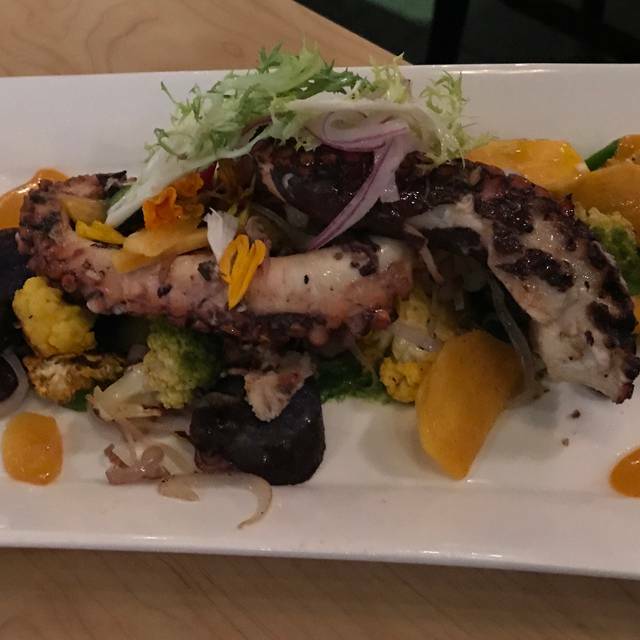 *Pulpo - grilled and slightly charred octopus with shallots, butternut squash and fingerling potato. This was a warm dish that was savory and almost comforting. I thought they did a good job with the large octopus tentacles where it was tender with a slight charred flavor that complimented the potatoes, shallots and butternut squash. 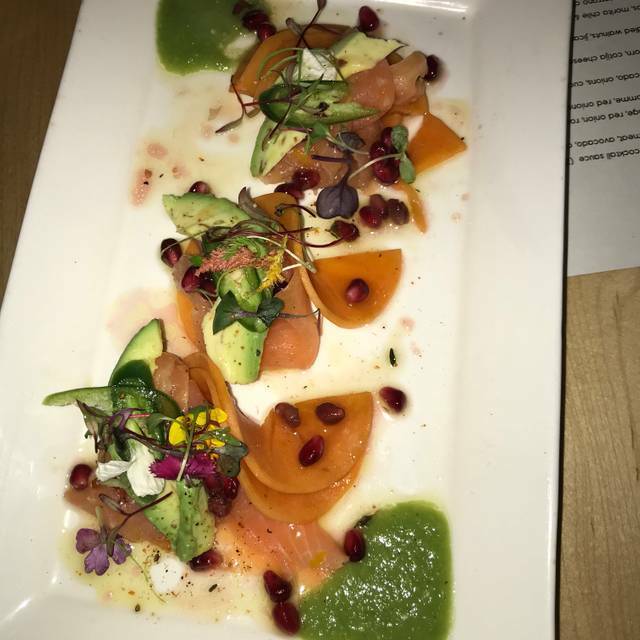 *Cured salmon - three portions of cured salmon dressed with some fresh greens, radish and a sprinkle of pomegranate seeds. On its own the salmon was definitely salted, not surprising as it has been cured. However, when you eat it with the greens and the sweet pomegranate seeds, it is a nice balance of sweet and slightly briney flavors. The ceviche was fine, the creamy avocado and the tangy sea bass went well together. This was what I was looking forward to ordering when looking at the reviews. Imagine a roll of mashed potatoes mixed with cheese, smoked pork and seasoning that has been lightly fried. It was then placed on top of a spread of aioli with a small piece of chicharon (fried pork skin) on top. Lots of textures and flavors going on. Would probably order again. This was a surprise as it was almost a perfect fish taco if I've ever had one. The fish was prop Gerly grilled, with some pineapple and green salsa on top on a blue corn tortilla. When you picked it up, it rolled up well and as you ate, it didn't fall apart. I think if I were to come back here, I may come for Happy Hour with friends....get a few drinks and have a few of their tacos. Really good food. Great service! Best restaurant in Redwood City hands down. Not only have they perfected their food, but their drinks are well worth trying at least once. I come here for every occasion and will continue to come back. We went there for the valentines special dinner. The appetizer and desert was delicious. The main course was a filet. Ordered the file medium rare but came out completely dry and over cooked. Very disappointed with the meat. Wonderful meal at LV Mar. Dishes were creative and delicious. Atmosphere was chic and lively. Perfect for a date night. We've never had a bad meal at LV Mar. The service is outstanding. Friendly and attentive and the food is amazing. Everything we have tried, we have loved. Amazing restaurant.